The Accordion element is available across all three builders. The Content Builder, the Header Builder and the Footer Builder. The purpose of the element is to output multiple groupings of content within a traditional "accordion" style component, which can be expanded or collapsed to reveal various sets of information. 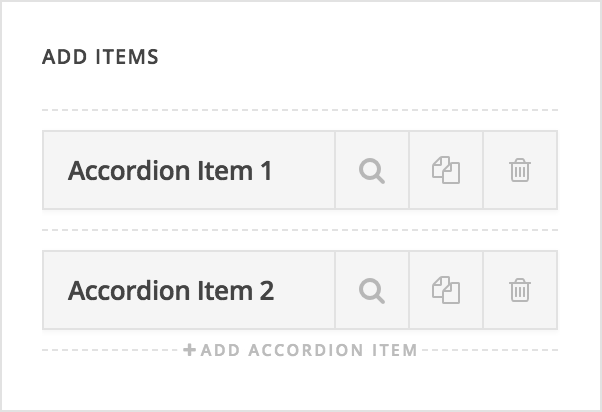 What we can see from the representative diagram above is that every Accordion is made up of one or more (typically at least 2) Accordion Items, and each Accordion Item contains its own Header and Content areas. The Header of the Accordion Item serves as the toggle that users can click to reveal the collapsable Content area. Below we will walk through the various controls available for each section of the Accordion and how you might use them to achieve certain looks. The base level control grouping is labeled Accordion, which styles the containing element that holds all Accordion Items. This is also where you will add your Accordion Items, which can be inspected to adjust content as needed. In this screen, you can choose whether or not the Accordion Item should start "open" (with the content area expanded), and edit the header and main content. Here you can perform many of the basic functions you see across other v2 elements such as setting a base font size, background color, and width/max width values. One control of note here is the Enable Grouping toggle, which if enabled only allow one Accordion Item to be open at a time, which can be helpful for certain situations. 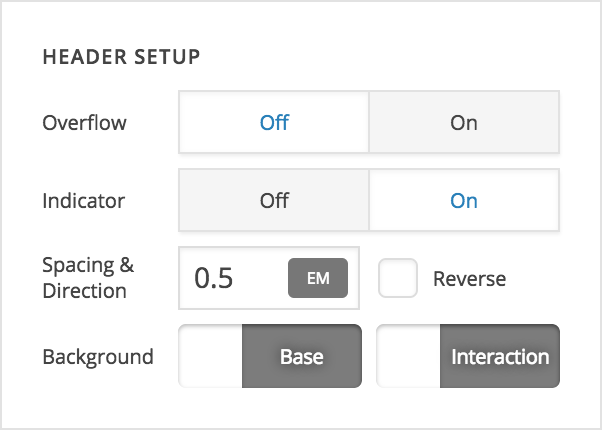 Selecting this control to be on will also reveal a text input labeled Custom Group. Leaving this input blank by default will only allow one Accordion Item to be open in that Accordion at a time. If you place the same group name into this input across multiple Accordions though, it will only allow one Accordion Item to be open across all of those grouped accordions. For example, if you had 3 different Accordions in use throughout your page and you only wanted one item to ever be open across all of them, you could give each of them a custom group name of "Group 1," which would ensure that this effect took place. Again, this is helpful for certain situations, but not always necessary. In addition to being able to specify a background color across all of your Accordion Items (which again, is the container holding the "Header" and "Content" areas), you can choose to disable the default content overflow of the containing element. 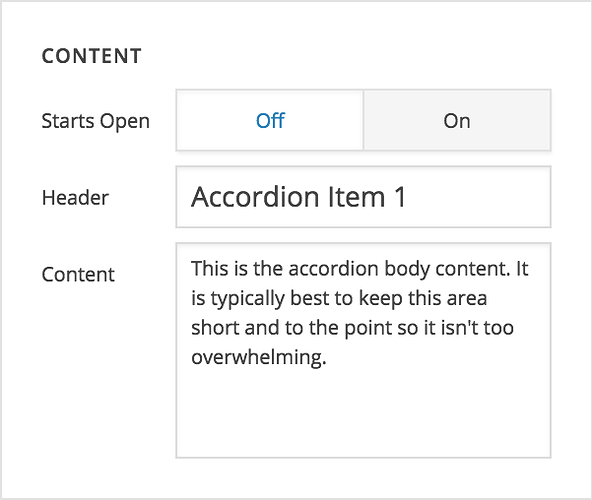 This is helpful in achieving certain stylistic approaches for your Accordion Items, but keep in mind that this means things like box shadows on the Header or Content area inside your Accordion Items will not be able to flow out of the Accordion Item container. Additionally, you can also set the Spacing control, which dictates how much spacing should be placed vertically between each Accordion Item. One thing to keep in mind here is that you can also use negative margins is you wish, which can help to create a more tightly "grouped" feeling. For example, if you placed an outer border on each item of 1px, you could experiment with placing a -1px spacing for each item, effectively placing them directly on top of one another and giving them a linked appearance. After that, you will find the traditional controls for things such as padding, borders, shadows, et cetera. This is simply a matter of preference as your design might work well with text wrapping to another line and you could leave it off, or you simply might prefer to ensure that all of your Headers remain the same height at all times even as your website sizes down responsively. Here, you will setup a few basic styles to give you Accordion Item Indicator the styling you want. 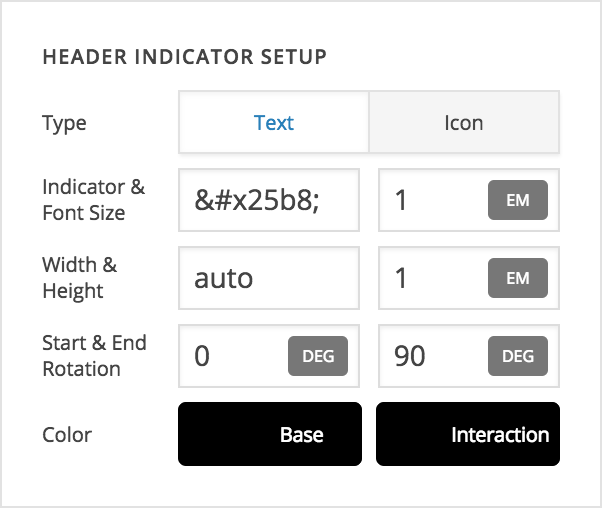 You can choose between using "Text" or an "Icon" for your indicator (in the screenshot above we're using "Text" with a unicode caret character for our design), as well as specifying the base size for your Indicator. 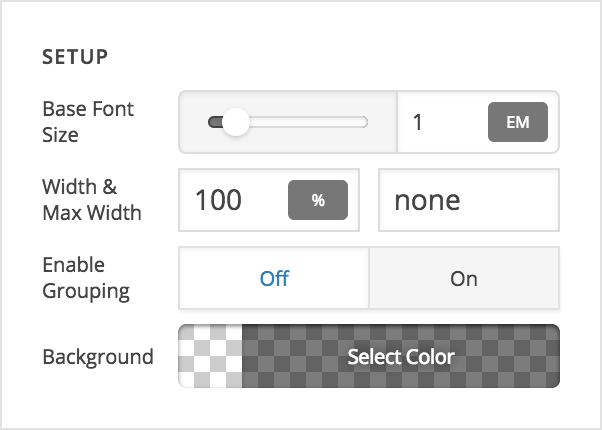 Next, you can specify a height and width if desired, which can be useful depending on what type of setup you're using. After that, you'll see the Start & End Rotation inputs, which is where you will specify a degree rotation for your Indicator for each state of your item (e.g. open and closed). For this example, our item is starting out with no rotation, but when the item is opened, the Indicator is animated to rotate 90deg, pointing downwards. This helps to give slight stylistic flourish, and can be used creatively with indicators such as a plus sign, which can be rotated 45deg to represent an "X." And finally we have the color of the indicator for when the Item is open and closed. After that, you will find the traditional controls for things such as margin, padding, borders, shadows, text, et cetera. 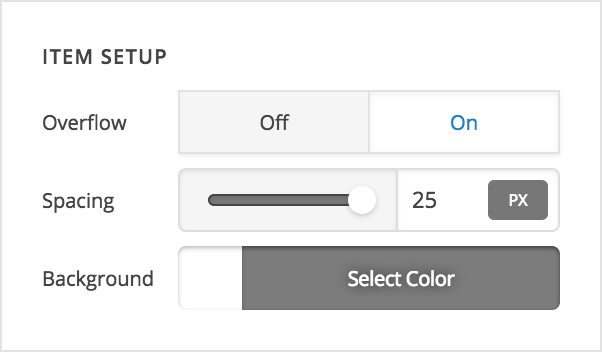 The Content control grouping is pretty straightforward, including background color as well as all of the traditional margin, padding, border, and shadow controls that you will be accustomed to seeing across all v2 Elements. Accordion: only one tab open at a time?